MB Magickal Name Software is just the very right tool for you if you are interested in getting a name reading according to the magickal astrology principles. A magickal astrology reading from this magickal software will let you know your magickal name and magickal number and also tell you the attributes of your magickal name or the influences of magickal number in your case. The significance of magickal astrology lies in the fact that an in-depth magickal analysis can reveal your stand with regard to the magickal world or occultism. To what extent you are serious or passionate about the mystic world and even with the association of the mystic elements and the mystic forces can be revealed through magickal analysis. 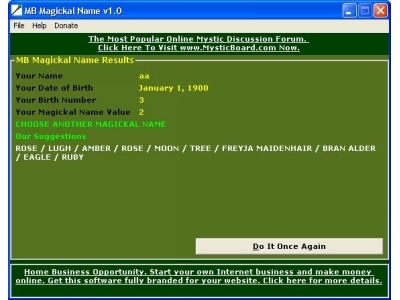 All you need to do is just to download MB Magickal Name Software.